Another characterful and sonically innovative offering from Sinevibes at an excellent price. Why still AU-only, though? Fun concept. Easy to ease. Broad range of results. Good for live or studio use. Excellent randomise features. Undo button would be nice. Automation fiddly in some hosts. 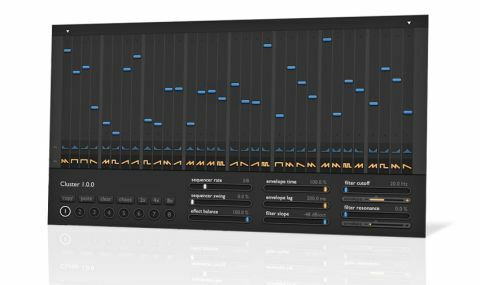 Ukrainian developer Sinevibes does a fantastic line in fun, interesting and affordable Mac plugins, but its output can be a little esoteric for some production palettes. However, its latest plugin - dubbed Cluster - could well find it tapping into a wider audience, delivering immediately ear-catching results that the bass music and EDM fraternities will surely fall in love with. "One way to describe the sound of Cluster would be as something like a cross between a filter and a gate"
Cluster is, in a nutshell, a sequencing filter plugin (AU-only - how we wish they'd start supporting VST cross-platform!) that uses an intuitive step sequencer to modulate the filter type. A simple but novel proposition, then, just as we've come to expect from Sinevibes. The sequence can be any length from two to 32 steps, and the steps can be set to a variety of note values, both regular and not-so: 1/16, 1/24, 1/12, 3/16, 3/8, etc. There's also a sequencer Swing control for applying shuffle to the progression of the steps. But what does the sequencer actually control? Each step hosts its own filter, chosen from a selection of low-pass, high-pass, band- pass and band-reject modes. The Cutoff and Resonance controls are set globally (ie, for all steps), but each step has its own modulation amount and modulation envelope shape, chosen from a list of eight. The envelopes are largely predefined, but you do get control over the length of each one and its 'delay' (how long it takes to kick in) via global controls that can be used to create short and choppy or longer, smoother transitions from step to step, and dial in a kind of off-beat bouncing effect. Perhaps one way to describe the sound of Cluster would be as something like a cross between a filter and a gate. It isn't a gate - let's be clear on that - but the patterns it generates can often impart that kind of vibe. It turns its hand well to glitching effects, musical gating effects, rhythmic patterns... It's a respectable range of sounds for such a specific plugin. The filters themselves, though not jump-out-of-your- seat fabulous, are good and certainly sound effective in the context of the plugin. Cluster also boasts a number of features of particular relevance to live performers. The most obvious one is the Wet/Dry control (also a useful studio feature for progressively working sizzle or wobble into a loop or riff, natch). The ability to randomise the modulation values, filter types and modulation envelopes independently via modifier keys is a boon for live spontaneity, too, helpfully made retractable by another modifier that sets all the steps for any of the three to the same value. These can be good for generating new presets as well, with a surprisingly high hit-rate. "Like most Sinevibes plugins, Cluster is a very simple effect with a surprisingly wide range of potential uses"
Then, of course, there's the key fact that the cutoff and resonance values are global but can affect each step very differently to the rest - so manual sweeps deliver far more energetic, radical and exciting results than you'd get from a conventional filter. Like most Sinevibes plugins, Cluster is a very simple effect with a surprisingly wide range of potential uses. There aren't that many presets included, but the ones that are there are useful, and it's really easy to use anyway, so you may not even need them. It isn't something you'll use every day, certainly, but its low price makes it a very affordable indulgence, and we'd call it a worthwhile purchase for anyone making any kind of electronic music.